If your home suffers damage in a flood, don’t count on homeowners insurance being enough to protect you. A standard home insurance policy does not cover flooding that originates outside your home, although some types of water damage may be covered. To get coverage against flooding, you will need a separate flood insurance policy. Here’s what you should understand. Your homeowners insurance policy will help cover other types of water damage that are accidental and sudden, however. This can include a burst pipe, a leaking water heater, or a broken washing machine, for example, which can all flood your home with water. The distinction is these sources of water come from inside your home — not outside. Your policy still won’t cover the damage if it’s a result of poor maintenance such as failing to repair a leaking pipe. To cover your home against flooding, you will need to buy a flood insurance policy separate from your home insurance. Don’t assume that you don’t need flood insurance just because your home has never flooded, you don’t live near a body of water, or you aren’t in a flood zone. After all, floods don’t pay any attention to flood zones and they can occur anywhere. Hurricane Harvey left widespread flood damage in 2017 yet a whopping 70-80% of homeowners did not have flood insurance. Don’t rely on flood zones alone when deciding whether you should buy flood insurance. Twenty percent of all claims to the National Flood Insurance Program (NFIP) occur outside flood zones and people in these areas receive one-third of flood-related federal disaster assistance. The average flood damage claim is more than $62,000. Just five inches of water may cause at least $11,000 in damage to your home, according to FEMA. This is certainly not a cost you want to face out-of-pocket after a disaster. Flood maps in many areas are outdated and too conservative, especially in areas with significant new construction. Flood insurance is required in high-risk designated flood zones but you have the option to purchase it even if you do not live in a flood zone. Flood insurance comes in two forms: you can buy a policy directly through NFIP, a federal program, or you can buy a private flood insurance policy through an insurance agent. A NFIP policy offers coverage up to $250,000 for your home and $100,000 for the home’s contents. It’s important to note that the NFIP only provides replacement cost coverage for your home itself. This means an NFIP policy will cover the amount needed to rebuild your home. Only actual cash value coverage is offered for your belongings. This means you only get the current value of your belongings, not the cost to replace the items. A private policy can give you a higher coverage limit to supplement a federal policy or as a standalone policy. If you are outside of a designated flood zone or a federal policy would be too expensive, you can likely save a substantial amount with a private policy. 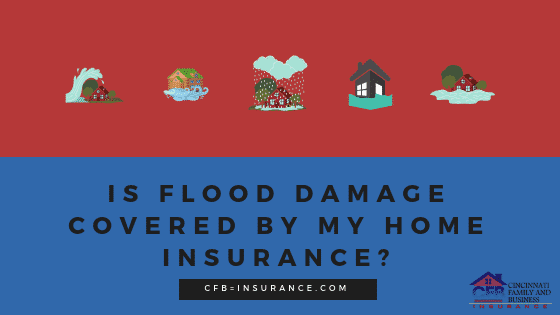 Private flood insurance also offers more coverage for belongings with the option to schedule personal property like collectibles and high-value belongings. If you are considering buying a flood insurance policy, don’t delay. Flood policies have a 30-day waiting period which means you won’t be covered if you buy coverage shortly before a disaster. If you live in an area that’s considered a low to moderate risk for flooding, you can qualify for very low premiums for flood coverage that can protect you if the unthinkable happens.